Rich in colour enhancing carotenoids, high in vitamins C and E, Aquarian Goldfish Flake 25g is specially formulated for all goldfish, including fancy varieties and provides a complete diet, promoting health and vitality. Recommended by top aquarists. Also suitable for small pond fish. 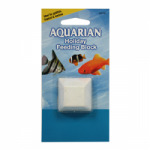 Aquarian holiday feed block will feed 20 average size fish in a 40 litre aquarium for 7 to 10 days.